Eleven years back today, Appalachian State paralyzed the school football world by strolling into the Big House and bringing down fifth-positioned Michigan as a FCS squad. Quick forward to Saturday evening and the Mountaineers — now in FBS — simply missed doing it once more, as the group flew out to Happy Valley and pushed tenth positioned Penn State to extra minutes. Be that as it may, the Nittany Lions could dominate the competition, 45-38. 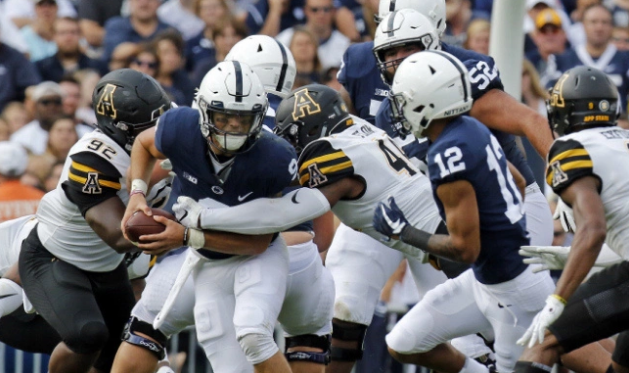 From the begin, Appalachian State took it to the Nittany Lions, which lost various key benefactors from a year ago's season, most outstandingly star running back Saquon Barkley and hostile facilitator Joe Moorhead. While Penn State scored on the opening drive, Darrynton Evans reacted by lodging the following kickoff. The two groups added a field objective preceding the half, sending the groups into the locker room tied at 10. The Nittany Lions seemed as though they woke up amid the second half, however, scoring 14 focuses in the second from last quarter. Notwithstanding when Appalachian State included a touchdown toward the beginning of the fourth, Penn State reacted with a score on the accompanying drive. The Mountaineers were brave amid the final quarter, notwithstanding, hanging 28 focuses on Penn State and driving the Nittany Lions to the edge. After Penn State's solitary final quarter score, Appalachian State walked down the field, scored, astonished their rivals with an onside kick, and scored once more. The blade seemed as though it was scored by Jalin Moore, who found the end zone on a 16-yard hasten. Penn State was given a concise promise of something better on its last drive, as K.J. Hamler conveyed the following kickoff to the Mountaineers' 48 yardline. With 42 seconds remaining, Nittany Lion flag guest Trace McSorley discovered Hamler for his first passing touchdown of the evening. Appalachian State took care of business the ball back and went down the field, however missed a 56-yard field objective on a fourth and 4. Penn State kicked it into high gear the ball back, however stooped out the clock to send it to additional time. The Nittany Lions got this show on the road the ball toward the beginning of the additional casing, riding beginning running back Miles Sanders to a score. The Mountaineers got an opportunity to coordinate that score and moved toward the end zone themselves, however Nittany Lion corner Amani Oruwariye grabbed Zac Thomas' end zone experiment with of the air. Appalachian State was relied upon to be among the best Group of 5 groups in the game, however this was as yet a gutsy exertion out of the Mountaineers.